Thanks to Lauren Land for bringing some of these over... not one I would normally pick up but that doesn't mean I shouldn't give it a try and let everyone know what I think! I poured this one from a 12 oz. brown bottle into an imperial pint glass. It poured smooth, copper orange color, crystal clear with a small white head. There is little retention on the head, and minimal lacing. I like the darker color, but nothing else about the appearance is inviting. The smell isn't strong, but at least there is some pumpkin in there. Also some malty aromas, a little chocolate even. 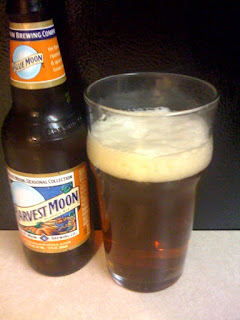 There is even more pumpkin on the tongue, along with the malt flavors... even a kick of pumpkin on the aftertaste. It's better than I expected for sure. Not bad at all for a macro beer, not the best pumpkin beer I've ever had... or even had in the last few weeks, but not a bad effort. I think of all the macro lines of beers the 'Blue Moon' beers from Coors tend to be some of the best. Another one from Coors/Blue Moon will be coming soon, their 2009 Grand Cru... so look for that one!